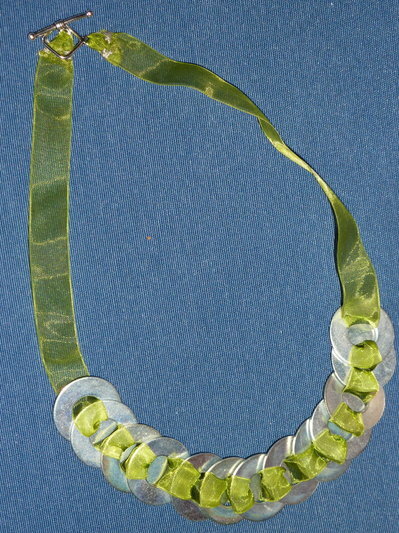 Anni Albers disegnò questa collana nel 1940 e seguendo liberamente il tutorial da www.thesmallobject.com (tradotto da me) sotto l'ho fatta anch'io! 4: Thread ribbon back up through washer #2 so it weaves underneath washer #1. 5. Repeat process. Thread ribbon up alongside edge and back down through the middle of washer #3. 6. Thread end of ribbon back through the middle of washer #2. 7. Pull ribbon tight to the right so you have all three washers laying flat. Repeat above steps. Tira il nastro destra in modo da avere tutte e tre le rondelle di piatto. Ripeti i passi precedenti.